Dr. Hameed is working as a Gastroenterologist with us. 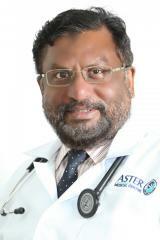 Dr. Hameed Hussain is currently working as a Gastroenterologist at the Aster Garden Speciality Clinic. He brings over 15 years of experiences as a Consultant Gastroenterologist and an Interventional Gastroenterologist, to the role. Furthermore, he has also gained the valuable experience of practicing in the Middle East through his work in Saudi Arabia. He specializes in performing all the diagnostic and therapeutic Upper GI and Lower GI procedures. Arabic, English, Hindi, Malayalam, Tamil.